Answering homeowner questions is probably the most important thing I do online. It’s certainly the most appreciated if the reader response I get is any indication. Ever since I first sent an email on August 31, 1997, I’ve answered individual homeowner questions for free online. Many of the situations I hear about are recurring, and that’s why you’ll find three of the most common questions and answers below. That said, each troublesome home situation is also unique, and that’s why I’m inviting you to send your questions to me right here. Don’t hesitate. Q: How can I warm the cold floor of my upstairs bedroom? There’s a garage underneath and the bedroom floor is always really cold in winter, even with carpet under foot. A: Cold floors are common in Canada because so many home designs have rooms located over an unheated space – usually a garage. You need to add more insulation to the floor, and possibly add more heat to the bedroom. Exactly how you do this is the big question. If the ceiling of your garage is open and uncovered with drywall or wood, then you’re in luck. 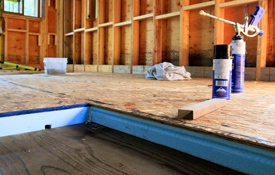 Apply 3- or 4-inches of spray foam to the underside of the subfloor and you’re done. This both insulates the floor above, and seals out drafts perfectly. You can buy tanks of foam to do this work yourself. If you can’t conveniently add insulation to the garage ceiling, then you’ll need to add it to the top of the bedroom floor. A couple of inches of extruded polystyrene foam on top, with sheets of 1/2-inch plywood over that, all secured with screws driven down into the underlying floor joists does an excellent job. On the downside, this approach does raise the height of the floor significantly, and only makes sense if you’re replacing the finished floor anyway. If you choose to insulate on top, live with the foam and plywood for a while during cold weather, without a new finished floor installed. If your toes aren’t quite toasty enough, consider adding electric radiant in-floor heating mats before the new finished floor goes down. Q: Why have the water pipes in my century home started to make noise whenever taps are shut off? How can I make things quiet? A: The problem you’ve got is called water hammer and it happens when shock waves travel through the pipes as water flow stops when a faucet or fixture is turned off quickly. Why it’s only begun to happen now, I don’t know. 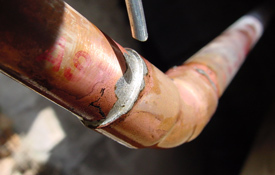 Wherever the pipes are loose, these shock waves cause vibration and noise, though a permanent fix is simple. Every plumbing supplier sells items called water hammer arrestors. 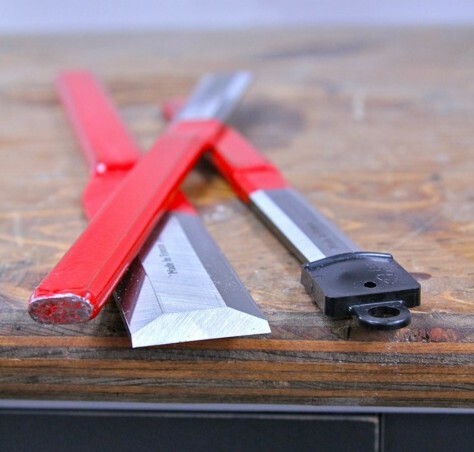 They’re short lengths of sealed pipe that get soldered vertically into the offending pipe somewhere, containing a cushioning volume of air that absorbs the shock that happens when water flow stops, eliminating the noise. The only disadvantage is that most water hammer arrestors only silence one branch of pipes. A better approach uses a pressure tank. This is a normal part of rural water systems that use pumps to draw water from wells and lakes, but they’re perfect as whole-house water hammer arrestors, too. Have your plumber install 5 or 8-gallon diaphragm pressure tank in the incoming cold water line where it enters your house and your pipe noise will stop, regardless of where it’s coming from. Be sure to specify a diaphragm-type tank. Pressure tanks without diaphragms are available, but they need to have air added to them every year or so to make up for the air that gets dissolved in the water and lost. 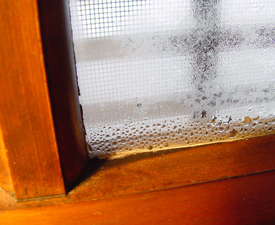 Q: Why do the insides of the windows on my four-year-old home get wet whenever it’s cold? Our furnace has no humidifier and the dehumidifier we’ve been running doesn’t help. A: Wet windows in winter are a common problem in modern Canadian houses and it happens because indoor humidity levels are too high in relation to the insulation value of the glass. When windows get cold enough they cause indoor air to condense and form moisture droplets on the window panes. As you’ve discovered, a dehumidifier offers no help because it can’t make indoor air dry enough. The only real source of relief involves bringing more outdoor air into your house, and you can do this in one of three ways. You can open windows part way before they freeze shut, or you can operate bathroom exhaust fans and range hoods more frequently and longer. Both these options work, but they also mean you lose heat. 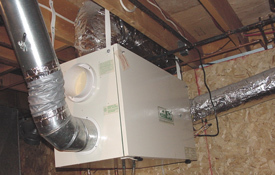 Another alternative is a heat recovery ventilator (HRV). These devices bring plenty of fresh, dry outdoor air into your home, and they do it while saving most of the heat in the stale air before sending it outside. HRVs are permanent devices that cost a couple of thousand dollars to buy and install, and they really do work. No matter how wet your windows are, they will be dry with a properly installed and operated HRV in your home. How do I properly insulate my basement using foam insulation?